Instant Kerala Backwater Holidays is a short and sweet way to experience the most famous backwaters of the region. This heavenly blessing of backwaters on Kerala is one of the prominent reasons why tourists come to this alluring part of India. This four day itinerary in its beginning only transports tourists to a network of lagoons, canals and backwaters of Alleppey. Later this fantastic sojourn takes a natural route through Kumarakom. Further the journey takes the tourists to discover the heritage of Cochin (Kochi) in the form of Chinese fishing nets, palace and Jewish Synagogue. Towards the conclusion, the Instant Kerala Backwater Holidays give tourists a chance to relax on the breathtaking Cherai beach of Kerala. Upon arrival in Cochin (Kochi) meet and greet our Incredible India Tour representative who will assist you on proceeding towards Alleppey for your first backwater experience. Upon arrival to Alleppey, board the luxurious houseboat which will give you a never before opportunity to sail through the backwaters of Alleppey. A sobriquet Venice of the east defines the romance of Alleppey's backwaters with the flourishing greens in the company of nature. 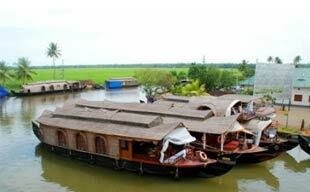 Enjoy the cruise on the heavenly backwaters on day 1 and succumb to the luxury of the traditional Kettuvallam. The unique thing about the houseboat is that not even a single nail is used to construct this 67 ft long boat. The construction of this luxurious boat takes eco-friendly materials like bamboo poles, coconut fibre, ropes, bamboo mats, carpets, etc and provides impeccable luxury standards during the backwater cruise. Lunch, evening tea/coffee snacks and dinner will be served on the houseboat only. Overnight stay in Kettuvallam. Post breakfast on the luxurious Kettuvallam, check out and transfer to Kumarakom. Kumarakom is another natural territory in Kerala famous for Vembanad, a freshwater lake and a namesake bird sanctuary. Kumarakom bird sanctuary came into existence 165 years ago when Alfred George Baker with his enterprising efforts converted the wetlands of the Vembanad backwaters into a fertile land. The 10 acre mangroves soon became the home of local and migratory birds and formed the foundation of idyllic Kumarakom bird sanctuary. Famous as India's first scientifically developed and preserved sanctuary, this natural hamlet is now a home for 180 bird species living in tune with natural bliss. 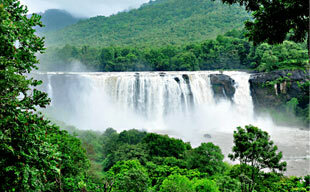 Post this natural excursion, visit the village in Kerala and try out fishing activity. Rest of the time is at leisure in the countryside resort. Overnight stay. After breakfast, check out Kumarakom resort and move towards Cochin (Kochi). This ancient sea port is one of the most popular cities of Kerala and famous as the gateway to God's own country. The fruitful sightseeing of Cochin (Kochi) includes a visit to the picturesque Chinese fishing nets, the oldest Jewish synagogue, the Dutch Palace and St. Francis Church. Further, move towards Cherai, the longest beach of the city Cochin (Kochi). Occupying the centre-north of the Vypeen Islands, this 10 km long beach runs parallel with Kochi backwaters and offers unique beach scenery of coconut trees. If you are lucky, you can even spot the dolphins in this beach setting. Upon arrival, check in to the resort and spend the leisure time at Cherai beach and resort. Overnight stay. After breakfast, spend time on the beach or resort. At 11 am check out the resort and proceed to Cochin (Kochi)airport / Ernakulam railway station with the incredible memories of India tour.